Sam Bennett looked like he comfortably had the legs to win the stage. But some confusion at the finish meant he was denied opening his 2019 account at the Vuelta a San Juan. A chaotic sprint and some confusion within his own team cost Sam Bennett the stage win at the Vuelta a San Juan today. The Bora-hansgrohe man ended the first race of his season in 3rd place. Irish champion Conor Dunne (Israel Cycling Academy) finished in the bunch in 83rd. Sam Bennett banged his bars in frustration as he crossed the line, expressing annoyance at what might have been. Bennett came from an awfully long way back in the final sprint. And while it will come as little consolation that he looked by far the strongest, he seemed to take 3rd at a canter. Peter Sagan tried to give his Irish team mate a perfect lead out. And it looked like Bennett was on course to come off Sagan’s rear wheel and pull the trigger. However, it soon emerged that it was another Bora-hansgrohe rider, Erik Baška, in Sagan’s wheel. 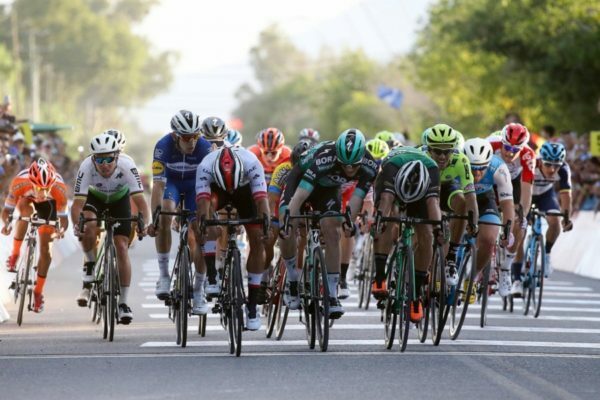 Bennett was further back, in about 10th place, following Fernando Gaviria (UAE Team Emirates) and Alvaro Hodeg (Deceuninck-QuickStep). Gaviria sprinted along the right side of the road when his lead-out man pulled over, with Hodeg next and then Bennett. Sagan was on the front to their left. The former world champion then pulled over to his right, in the apparent belief Bennett was coming around him. Instead, he inadvertently closed the door on Sam Bennett just as he was gaining on Hodeg and Gaviria and preparing to come past them. In the end Bennett somehow found a way to squeeze through for third place. He was sandwiched tight between winner Gaviria and runner-up Matteo Malucelli (Caja Rural-Seguros RGA) crossing the line. When Sagan veered across the road into his path, Bennett was forced to freewheel at a moment when he was looking faster than Gaviria. But while the road cleared a little for the Irish rider just before the line, allowing him to pedal again, he was out of time to pass the two riders just ahead. Bennett simply lost Sagan and Baška in what was a very messy finish and had to settle for 3rd on stage 1. He saw a perfect opportunity to win and take the race lead slip through his fingers at the end of 159km into Pocito. But having finished 3rd despite coming from so far back and being forced to freewheel at a key moment, he looks to have wintered well. A lumpier stage tomorrow could suit him if he rides the smaller climbs better than the other fast men, as he often does.